In an astigmatic eye, the cornea has an uneven curvature. 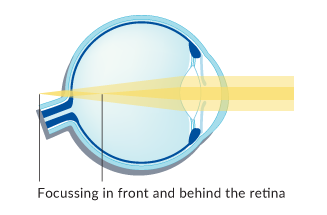 Instead of converging at one focal point, light rays merge in a line in front of or behind the retina. Astigmatism can also occur in combination with near-sightedness and far-sightedness. Result: a distorted view of objects. In case of astigmatism the laser will remove corneal tissue ellipse-shaped, making the cornea flatter where it is too round and rounder there, where it is too flat.